Botti Rubin Arquitetos Associados is managed by architects Alberto Botti and Marc Rubin, two former Mackenzie students who graduated at the beginning of the 1950s. Founded in the late fifties, it is the oldest active Brazilian architectural firm run by the same founding partners, so the firm represents one of the longest-standing architectural partnerships, even on an international level. Headquartered in São Paulo, Botti Rubin’s staff includes approximately 30 architects (some with over 35 years of experience working at the company and who today are firm partners) and has been responsible for around 1,000 buildings throughout its history. 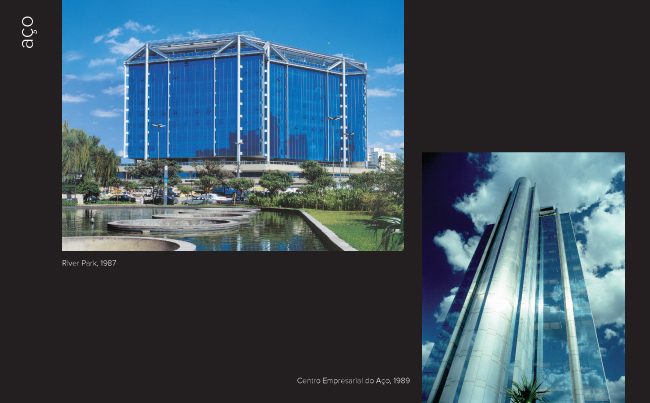 The firm has designed a range of projects comprising residential buildings (including several jewels admired by the local architectural community, such as the São Félix building) high rise office buildings, hospitals, large shopping malls (such as Shopping Higienópolis, in São Paulo), multi-use buildings, like the 280-thousand square meter Centro Empresarial Nações Unidas, also in São Paulo. 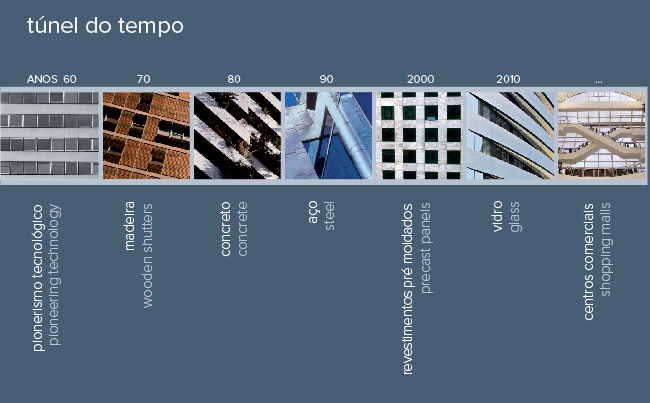 Looking at the evolution of building façades concept over nearly six decades, a timeline can be traced due to the development of a constantly updated architectural constructive technology language used within each period. This trajectory can first be seen starting with the Nestlé headquarters building’s casements with internal blinds comprised in reversible windows designed in the 60’s, then residential buildings with exposed concrete structure and apertures shadowed by wooden louvers. Other conceptions result in buildings standing on relevant external steel structures, others highlighted by precast building façade elements. 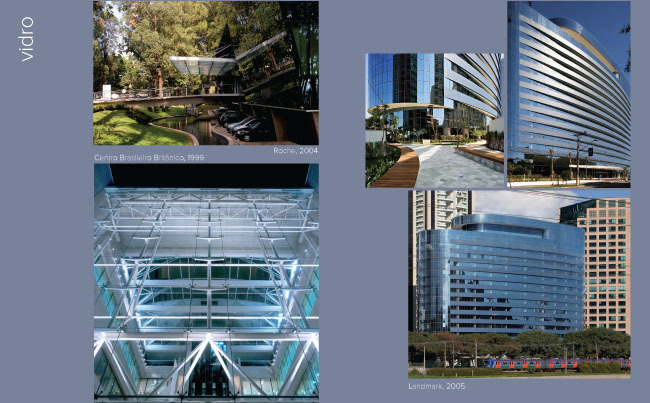 Although structural integrity and acknowledgments of the nature of materials has always been present in Botti Rubin’s projects, nowadays mostly glass façades transparent or not has been the main visible feature in the shells, following main international trends in building façades of commercial buildings. 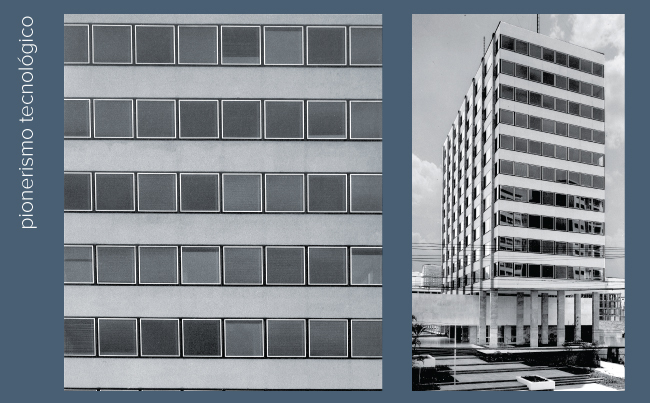 Constructed for the Nestle Brazilian branch at the beginning of the 1960s, this building façade’s highlight is the closure of typical floors using innovative (within the Brazilian context) Swiss technology for reversible extruded aluminums windows including moveable blinds positioned between two glass panels. Sold to the University Instituto Mackenzie, the building today houses classrooms and the casements still function after 50 years, but will now be upgraded. 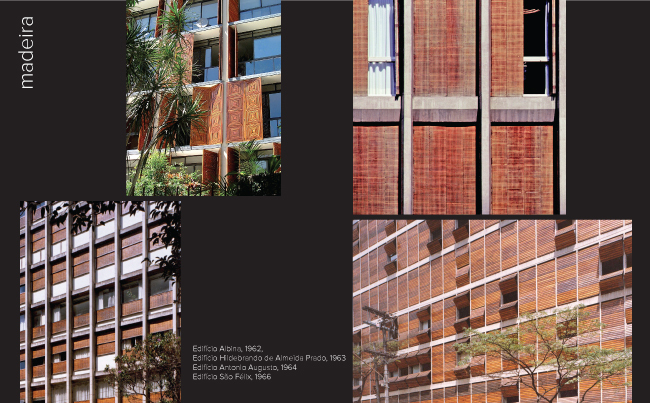 During the 1960s – especially during the first half of this decade – Botti Rubin developed a series of residential building projects in São Paulo characterized by a single architectural language: sealing elements with wooden louvers that contrasted with the expose concrete structure, large internal spans without internal columns and structural visible transitions on the ground floor. During the 1970s, exposed concrete structure still prevailed within Botti Rubin’s architectural production. 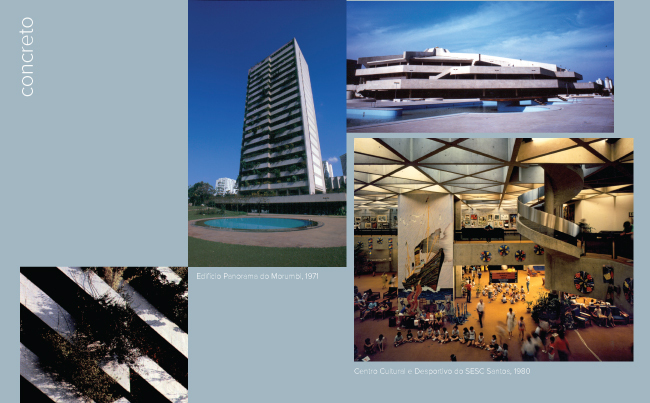 In this context, the Panorama do Morumbi residential building (designed in 1971) stands out, as well as the SESC Santos building (1980), whose horizontal, concrete demarcations possess a rich volumetry that is the result of its hexagonal frame structure. The advance of glass and steel technology in the 1980s made a new architectural language possible for building façades. One milestone of this era is the River Park Building (1987), located in the Avenida Berrini. It was the first building in Brazil to be clad with stainless steel sheets. Another noteworthy building is the Centro Empresarial do Aço (1989) - which was designed in partnership with the Toscano architectural firm - a building whose visible external metallic structure highlights its structural solution. In the 1990s, Botti Rubin designed projects that paved the way for a new style of building façades in Brazil, now commonplace, precast grids of concrete glazed panels or granite ventilated over the structural grids. 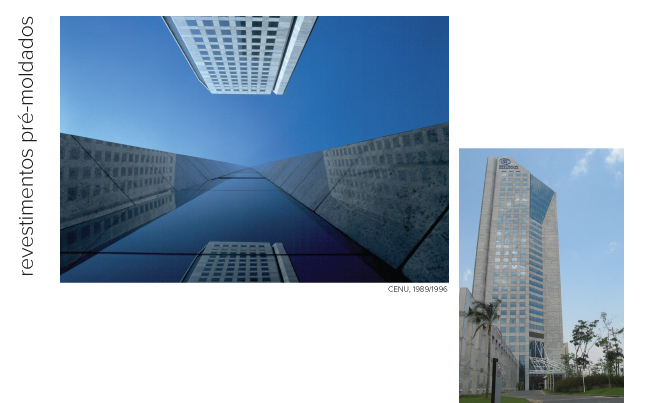 The centerpiece of this style in Botti Rubin portfolio is the Centro Empresarial Nações Unidas (CENU - 280.000 square meters) with granite and glass buildings façades geometrical unconventional shapes and including the Hilton Hotel in São Paulo. The highlight of the Centro Brasileiro Britânico façade (1999) is its structural, glass-closed atrium composed of casement-free glass front. Hold by ‘spiders’, (now very common but unknown or unused in Brazil at that time) which connects glass to an internal and freestanding three dimensional metal structure, The Landmark’s building (2005) glass reflexive elliptical volume, stands out in contrast with high-rise neighbors on the Pinheiros Marginal, in São Paulo. Lastly, the Roche Diagnóstica headquarters is also totally glass clad and comprises vertical and inclined facades. As a result, the volume behaves like a multi face reflective volume, integrated to its surrounds and melting visually in the surrounding mass of trees. 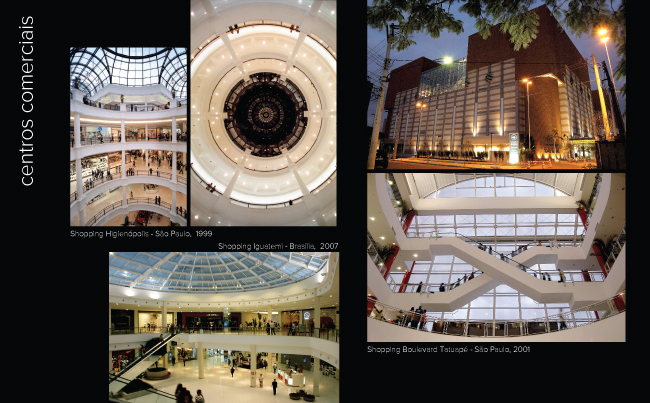 Shopping malls projects have been important throughout Botti Rubin’s architectural career. Some malls that particularly stand out include Shopping Boulevard Tatuapé (2001) and Shopping Center Higienópolis (1999). Brasília’s Shopping Iguatemi is one of the team’s most recent projects. At the center of Brasilia this modest addition to the local outstanding architecture comprises a large internal glass covering area that particularly stands out.